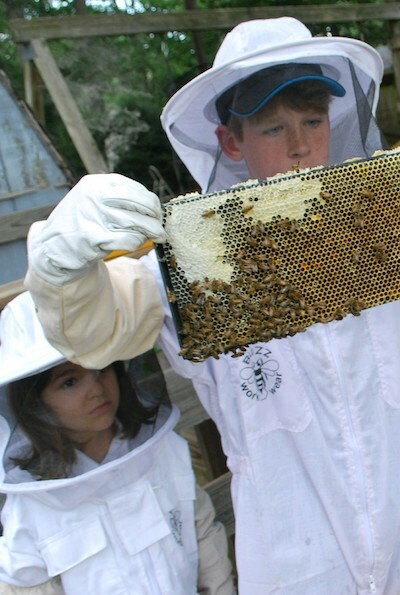 Hidden Meadows 4-H, the only program dedicated to beekeeping in the Carolinas, has been teaching young members to manage their own apiaries starting in 2016. In conjunction with the Union County Beekeeping Association, NCSBA provides funds, equipment, starter livestock, and skilled beekeepers to the club, along with Born and Bred training to keep 4-H programs sustainable by teaching members how to raise their own queens and produce healthy, vibrant bee colonies for distribution within the 4-H community. NCSBA beekeepers also help 4-H members learn to market their honey at the Union County Farmers Market and how to explain to the public about the importance of bees in agriculture. Are you a 4-H leader, member or parent? Would you like to start an apiary program? Not sure how to start? Contact the 4-H Coordinators of the NCSBA to learn more. We are always interested in helping others establish 4-H beekeeping clubs. NCSBA donated $500 towards equipment and livestock. Using the Born and Bred method of queen rearing, 14 nucs were donated to first time beekeeping members. Made three school appearances on Ag Day at three different high schools, complete with an observation hive, reaching more than 2500 children and teens on the importance of bees. We hope to have someone from 4H at every Union County school for Ag Day in 2019. Sponsored the North Carolina Youngest NCSBA Certified Beekeeper. Kudos to Sam Hunnicut. We are very impressed. Went from 5 to 10 colonies during the year. With that, we ended the year with 19 more colonies than we started.